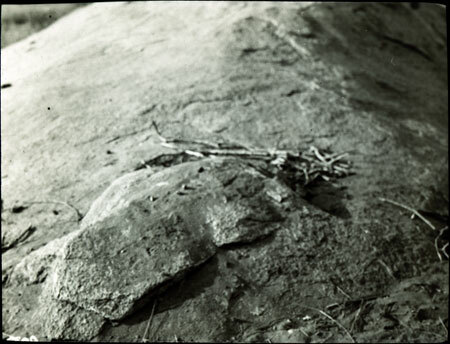 One of the sacred soba stones at the base of the Gule massif, associated with the ancestral-mythical figure of Queen Soba, with votive offerings placed upon it. There were several such stones, this one at the base of the hill. Another spherical one around 18 inches in diameter was used as part of the initiation of new chiefs. Manual catalogue entry (thermofax catalogue copy in folder '27-06 Seligman Slide Collection') - "V.e.27. Jebel Gule, part of rock Soba with votive offerings. (709)"
Note on lantern slide ms ink - "V.a.27. Jebel Gule, part of rock Soba with votive offerings. (709). CGS"
The Soba stones are discussed in C.G. & B. Seligman's Pagan Tribes of the Nilotic Sudan (London, Routledge 1932) p.428-9. Morton, Chris. "Jebel Gule sacred stone" Southern Sudan Project (in development). 03 Jan. 2006. Pitt Rivers Museum. <http://southernsudan.prm.ox.ac.uk/details/1967.26.177/>.